An integrative cell migration model incorporating focal adhesion (FA) dynamics, cytoskeleton and nucleus remodeling, actin motor activity, and lamellipodia protrusion is developed for predicting cell spreading and migration behaviors. This work is motivated by two experimental works: (1) cell migration on 2-D substrates under various fibronectin concentrations and (2) cell spreading on 2-D micropatterned geometries. These works suggest (1) cell migration speed takes a maximum at a particular ligand density (,1140 molecules/mm2) and (2) that strong traction forces at the corners of the patterns may exist due to combined effects exerted by actin stress fibers (SFs). The integrative model of this paper successfully reproduced these experimental results and indicates the mechanism of cell migration and spreading. In this paper, the mechanical structure of the cell is modeled as having two elastic membranes: an outer cell membrane and an inner nuclear membrane. The two elastic membranes are connected by SFs, which are extended from focal adhesions on the cortical surface to the nuclear membrane. In addition, the model also includes ventral SFs bridging two focal adhesions on the cell surface. The cell deforms and gains traction as transmembrane integrins distributed over the outer cell membrane bond to ligands on the ECM surface, activate SFs, and form focal adhesions. The relationship between the cell migration speed and fibronectin concentration agrees with existing experimental data for Chinese hamster ovary (CHO) cell migrations on fibronectin coated surfaces. In addition, the integrated model is validated by showing persistent high stress concentrations at sharp geometrically patterned edges. This model will be used as a predictive model to assist in design and data processing of upcoming microfluidic cell migration assays. Dynamic model of cell migration. 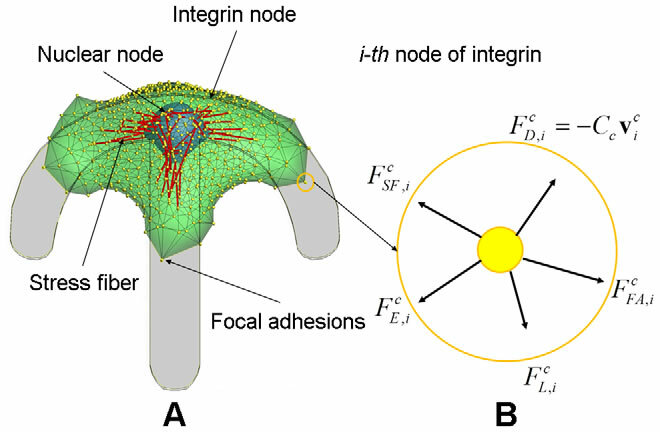 A) Integrated cell migration model consisting of the cytoskeleton, the nucleus, N integrin nodes on the surface of cytoskeleton, N nuclear nodes on the surface of nucleus, and two types of actin SFs which connect the integrin node to the nuclear node and between integrin nodes; a top view of the model showing triangular mesh network of double membranes of cytoskeleton and nucleus. B) the free body diagram of the i-th integrin node in the circle marked in A) where five external forces are acting. 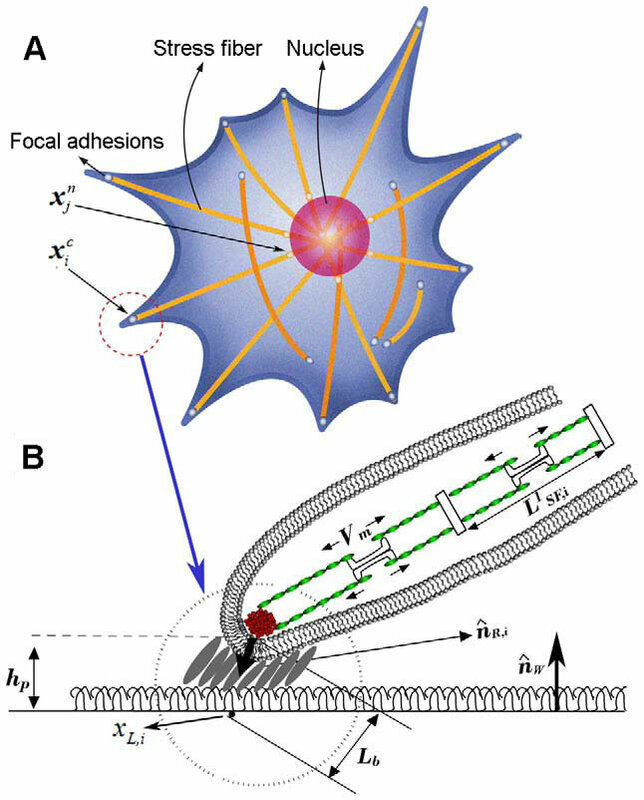 Note that, while shown in 2-D, the force balance exists in 3-D.
3-D integrated cell migration model A) schematic representation of cell migration model on the planar substrate, showing deformable cell and nuclear membranes, focal adhesions, and actin SFs, B) a magnified view in A) showing the structure of focal adhesion including the attachment of the end of SFs through an integrin node to the underlying extracellular matrix, illustrating a stochastic ligand-receptor bonding process at the focal adhesion site, and showing the structure of actin SFs. Note that, A) and B) represent top and side views, respectively.